Anthony Watts is running out of things to write about again. 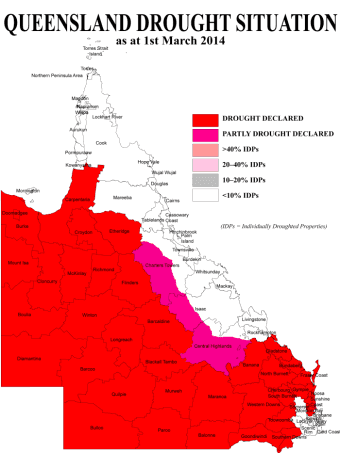 He doesn't want to talk about the Queensland drought, that's broken all records for area declared. He might not even know about it. Nor has he made any comment about the fire that broke out during the bushfires in Victoria a few weeks ago. Fires in the Hazelwood brown coal mine threw ash and toxins everywhere and sent the town of Morwell packing and is costing taxpayers heaps! For the past few weeks we've been told it "should be out in a few days". Now that's all happening here in Australia so it's probably too far away for Anthony to notice. His own home state might benefit from an El Nino, but Anthony hasn't yet figured out an angle to write about the possibility later this year. Robert B. writes via email with a question that we’ve just never asked readers to weigh in on here before in post, though has been bandied about in comments. I figure it is about time to put it to rest by asking up front. What is the perfect temperature of Earth? I’m assuming that climate change-related taxes will be used to bring our planet back to the perfect temperature, and I need to know when that has been reached. Okay - what's wrong with that question? First of all, Robert B. doesn't seem concerned about tax breaks, concessions and subsidies for fossil fuels but he really, really doesn't like the idea of clean energy. 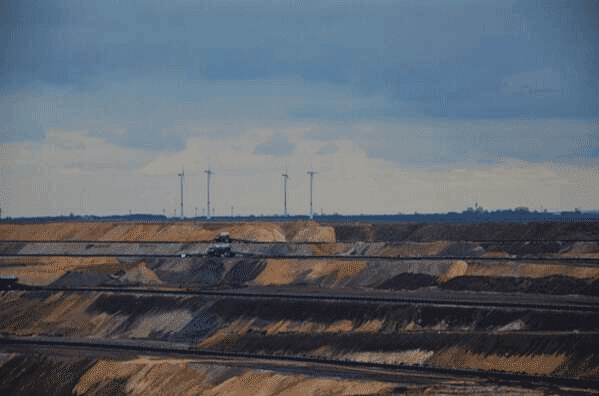 What do you reckon - these wind turbines really are ruining the landscape, aren't they?? Secondly, he's under some illusion that if we cut carbon emissions then the surface temperature will suddenly drop. You'd think Anthony would set him straight, but then Anthony probably thinks the same. Either that or he knows his audience is too ignorant to know any differently. Thirdly, Robert B seems to think that it's temperature that's the biggest problem. That is already bringing problems, but the bigger problem is the rate of change. We're already warming faster than ever in millions of years and are heading for ten times faster warming than in 65 million years. Do you think O’Bummer might know the answer? Nobody has that answer, and they spend billions of dollars insulting anyone who dares to ask. 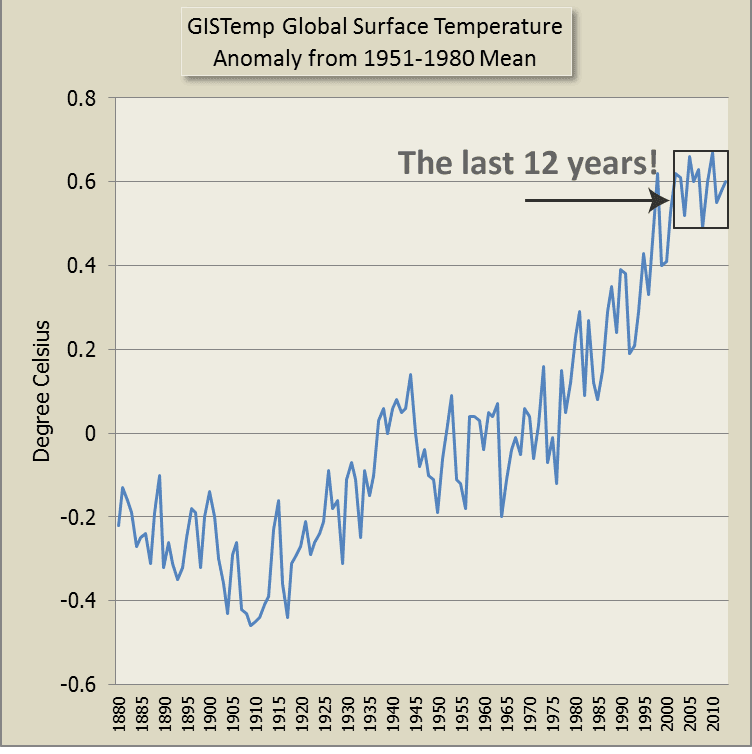 The ideal temperature is about 0.5 degrees warmer than now, with a CO2 level at about 500 ppm. If we can keep the green crowd from ruining our economies, and the sun cooperates, we will achieve that in about 2050. Otherwise it’s Ice Age time. March 7, 2014 at 6:34 pmThe perfect temperature is about M30 Celcius as in Winnipeg for the past couple of months. We have 700 houses with no water due to frozen water lines and we have not heard from the AGW crowd about the last dozen years being the warmist in history. It’s the wrong question, of course. No one cares what the “perfect” temperature for the Earth is, if there were such a thing. The right question is what temperature is best for our human civilization? The answer is the range that has existed since human civilization started several thousand years ago, or at least changing at a pace that can be adapted to. Sea level rise, widespread changes in weather patterns that impact food supply, or any of a number of other changes that increased greenhouse gases might push outside that envelope are what policies are trying to avoid. Policies aren’t trying to “bring back” temperatures anywhere. They are trying to keep us from sending them some place we can’t get back from. "What is the perfect temperature of Earth?" The temperature that our civilisation has evolved alongside and is therefore adapted to. Pretty bloody obvious really. But I expect that WUWTers will somehow conclude that it will be whatever fossil fuel industry profits dictate we must suffer. And I say that because - whatever the topic - climate change denier opinion seems to coincide with fossil fuel industry interest. "the temperature that our civilization has evolved alongside and is therefore adapted to.."
That is really quite dubious. Homo Sapiens both knows how to make fire and how to dress. Thus able to spread worldwide into any climate and temperature very long before that fameous civilisation was invented. Our species is quite obliously quite extreemly adaptible to temperatures and climates and enviroments. And quite omnivor also. Thus its success. I think we should conclude that it is rather a dubious way to state the problem, a way that will not keep. ...and when vaste swathes of croplands are no longer suitable for growing wheat; why, we'll just harvest the buckbush that grows there, instead! Not only that, but when climate changed drastically in the past (before the Holocene), there weren't many humans around. So those that didn't die off were able to move and colonise new territory (or fight for it). People living in on land that will not be tolerable in the future will either die in situ or will try to migrate elsewhere. (See latest IPCC report.) Who's going to move over to let them in? Abbott is busy turning back the few boats that try to get to Australia now. There will be a lot more boats in the future. Unless we drop CO2 emissions fairly soon, there'll be a lot of conflict probably starting around mid-century and then ramping up. That in turn may well have the effect of reducing CO2 emissions and/or increasing aerosols - so we might inadvertently help the situation albeit not in a very palatable manner. "we might inadvertently help the situation albeit not in a very palatable manner." This is a subset of a much larger issue of sustainability, a concept generally seen as "nice to have" or "too expensive". However, the reality is that our existence *will* become sustainable, the only question is whether we achieve this in a controlled or uncontrolled manner. At the moment we're choosing uncontrolled. Our species can adapt to temperature and yet the vast bulk of humanity lives in temperate river valleys, and indeed has done so since agriculture became established. Just the glacier-fed rivers originating in Tibet and the Himalayas support more than half the world's population. A climate which allows that to continue is desirable. One that doesn't, isn't. The situation now is what we're concerned with, not a world with a population of 150k who've barely made a mark on it. 7.2 billion and rising. What Leo geiger said. I don't think I could improve on that. How long's he going to last there I wonder? I think Lou Geiger will be banned from WUWT very soon. His rationality might spread to other WUWTers and Watts could not put up with that. A vanishingly small risk of, for Watts, a calamitous outcome - fer sure, action must be taken. Speaking of the Queensland drought, the Warwick Hughes misnamed blog "Errors in IPCC climate science" has an article http://www.warwickhughes.com/blog/?p=2775 "BBC now spreading lies about Queensland drought" which contains a link http://statements.qld.gov.au/Statement/2014/3/7/the-largest-area-of-queensland-ever-drought-declared to a Queensland Government Press Release "The largest area of Queensland ever drought declared". Which is prefaced by the statement: "Not a reliable guide to the rain that fell over Queensland last month." and a link to a previous Hughes blog article http://www.warwickhughes.com/blog/?p=2761 "No excuse for this ABARES - CSIRO - Bom soil moisture map not being up to date." Actually they are up to date if you check the most weekly soil moisture maps for February. The soil moisture map posted by Hughes is for January not February. The two Hughes' blog articles rely on comparisons between monthly Rainfall maps and monthly Soil Moisture maps but excludes monthly Temperature maps which might explain why there's not a lot of moisture being retained by the soil. No reference by Hughes to the grass growing seasons (Dec to Jan in the northern regions of Qld, lengthening to July in the southern regions) for Mitchell grass ( http://www.savanna.org.au/qld/mg/mggrazing.html ) being out of kilter with the rainfall. No reference to the effect of spring bushfires on pastures, the effect of high temperatures on plant transpiration and soil evaporation, etc. Hughes should take his own advice and work his way through BOM rainfall maps from June 2013 ( http://www.bom.gov.au/jsp/awap/rain/index.jsp?colour=colour&time=history%2Fnat%2F2013050120130531&step=8&map=totals&period=month&area=nat ) to February 2014 to see why so much of Queensland has been drought declared. Then he could work his way through BOM monthly max. temperature maps from September 2013 ( http://www.bom.gov.au/jsp/awap/temp/index.jsp?colour=colour&time=history%2Fnat%2F2013080120130831&step=5&map=maxave&period=month&area=nat ) to February 2014. Typically for sites like the EiIPCCcs site, the headline acts as a Pavlov's dog whistle for those who, for reasons unknown, frequent those sites i.e. "BBC now spreading lies about Queensland drought". Strange (actually no it's not) that the headline isn't "Conservative Queensland Government now spreading lies about Queensland drought" or "Queensland graziers hoodwink governments to get drought relief handouts". Beats me why the opportunity was lost to post a more flame-fanning headline such as "BOM and CSIRO provide false information to Queensland government! ".